The new features is called Clear Chats and it's rolling out globally. 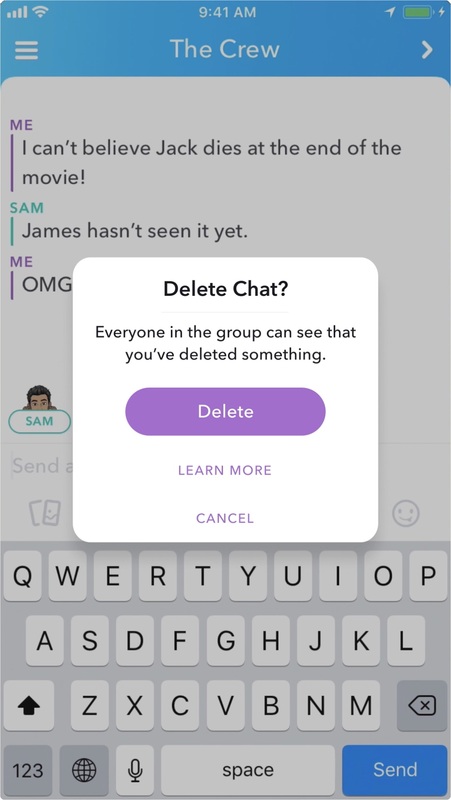 Today, Snap announced that it is introducing a new feature called Clear Chats. Users will now be able to delete sent messages in individual and group texts, regardless of whether they've been viewed or saved. This allows you to fix a typo or just retract a message that you sent inadvertently. In order to delete a message, go to the message or conversation where the item in question was sent. Long press on the message or media (sticker, audio or video, etc.) and tap "Delete." The message will be gone, and friends in the individual or group conversation will be alerted that a message was deleted. If no one has viewed the message, then you're set. However, this feature will, of course, not be able to delete screen shots, so it's always a good idea to take care with what you send to people. Still, this is a nice feature that gives you a little more control over your Snaps. It will roll out around the world over the next few weeks.